JPM Edu Solutions is a training institute offering courses related to technologies like Data science training, Hadoop Big-data training, Cloud Computing, DevOps Training, Mobile application Development and IOT. In a short span of 6 years, we have trained over 10,000 students with the assistance of a highly skilled team of 18 trainers. Our motive is to offer the best training services in Chennai for making our students enriched in all the niche technologies, thereby helping them land in their dream jobs. Mobile application development course will mainly enable you to write your own applications by using the native languages. Learning mobile application development training in will help you grab knowledge about application development and also give you a hands-on exposure, thereby landing you in good developer positions. DevOps (Development Operations) is a result of the close integration of a group of individuals from different backgrounds of software development and software operations. Joining this course in Hadoop big-data training in Chennai, will open doors for securing a high-level position, in any IT-based firm or a company that deals with cloud computing and server management. 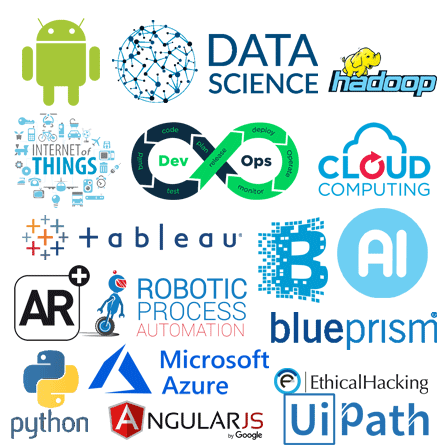 Data Science is the knowledge of gathering information from varied sources from the Internet. It is helpful in devising strategies for developing the business and for creating successful business models. With the knowledge in the field of Data Science with R and machine learning, you can apply for top MNC companies aiming for top-level positions. We have a hand-picked team of highly qualified professionals who are steered towards training the students and leading them to greater heights. The latest technologies in the IT field which are hot-selling such as Hadoop, IOT and Cloud computing are taught as courses here in JPM Edu Solutions. JPM EDU Solutions offering Best IT Software Training like Cloud Computing, Hadoop Big-Data, Mobile Application Development and Corporate Training etc..
Why JPM is the best training institute in Chennai ? Individual attention is guaranteed for each student taking up the course and any clarifications or doubts are addressed promptly. Technology experts are brought to our institution periodically in order to give further knowledge to our students. We are the most trusted providers of Professional Software Training in Chennai for our consistent performance in this field for years. Performances of the students are regularly tracked in order to keep watch of their progress by specially prepared question papers. Our trainers mainly work on maximizing the strengths of our students and identifying their weaknesses to diminish them. JPM Edu Solutions offer best training on Big Data, Cloud Computing Training from real time experienced experts.